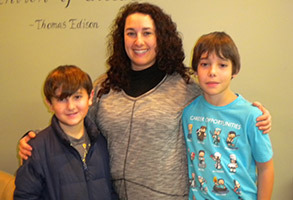 Congratulations to Loretta, Max and Andrew for being our February Patients of the Month! Loretta started care at Precise Chiropractic in January 2015 after hearing Dr. Cramer on her weekly radio show on WMUZ. Prior to starting care at Precise Chiropractic, Loretta had suffered with low back pain for over 10 years. She also had neck and arm pain as well as numbness. Both Max and Andrew also started NUCCA care in July 2015 for general wellness care. Loretta says that Dr. Cramer and NUCCA has 100% improved her life and lifestyle. When asked to describe her visits to Precise Chiropractic Loretta says she gives the office an “A+”. “Everyone is so nice and I felt comfortable right away!” she says.